So I am often asked as a musician, who are my influences. That is always a tough question, because everyone and everything is my influence, but I usually respond with Jaco, J.S. Bach, Paul McCartney, Beethoven, Geddy Lee, Scot LaFaro.... uh.... Joe Kapp and Bruce Lee... What?!? Most of musicians I know, love sports. And think about it, with all of the fine tuned body mechanics, from breathing to core strength to the hand dexterity, plus the endurance of an 8 hour per day practice schedule necessary to be being a top level performing artist - music is indeed an athletic activity. So too the best athletes are indeed artists. I love American Football, I loved to play it in my "Musicians Football League" (check out my satirical essay Football for Musicians ) and I love watching the strategy of the game, and how the highly developed artists compensate and improvise when a play does not develop as planned. It is music! The same is true when watching a good MMA match. While I am not really into the violent aspect, the good MMA artists, understand it as a sport where athletic competition is a "puzzle" to be solved - where the process of solving aids in the development of ones character and ability - where using the best of everything you have helps develop the character and ability of your opponent. As a philosophy major, music educator, and amateur mixed-martial artist, I am always keen on learning more about the intersection of the mind, spirit and body -- i.e. the Human Being and how Being interacts with the environment. This approach helps my own playing, but more importantly it ensures that my students learn to turn their entire body into an instrument which is freely capable of "singing" their mind. And "conversing" with others. To do this, I spend a great deal of time developing of a fine tuned, relaxed technique, with the entire body free from tension. It is especially tough for some of my younger students who just want to learn flashy riffs and play fast right away. (Speaking as an aficionado of heavy metal, one cannot ever hope to play fast (and groove) if they are full of tension.) - But again we are learning not simply for ourselves but to play with others, engage in musical dialog and raise the level of discourse. 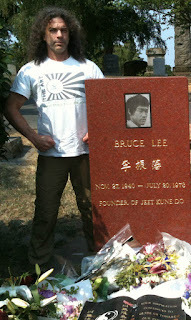 This past summer I had the opportunity to pay my respects to Bruce and Brandon Lee. I opened my copy of his Tao of Jeet Kune Do and discovered passages which to my mind coincide with my approach. Art is never decoration, embellishment; instead, it is work of enlightenment. Art, in other words, is a technique for acquiring liberty. The aim of art is not the one-sided promotion of spirit, soul and senses, but the opening of all human capacities - thought, feeling, will - to the life rhythm of the world of nature. So will the voiceless voice be heard and the self be brought into harmony with it.